Nick Dittmeier and The Sawdusters Midwest Heart, Southern Blues is good time, Saturday night, Honky Tonk music that keeps the dance floor packed and the Preacher’s Sunday sermon at least one last call away. Like his Indiana contemporary, Austin Lucas, Dittmeier writes songs that are upbeat in the classic Southern Rock tradition but with thoughtful lyrics about people barely getting by and people slipping through the cracks of the dying American Dream. “My True Love” is the opening track and sets the tone with a raucous good time foot stomper, highlighted by sizzling guitar work and tight vocal harmonies. This album is a true band effort. The Sawdusters are integral to the overall sound of Nick Dittmeier and The Sawdusters and each musician adds to the cohesiveness and focus of the music. This is music that demands to be be played loud and heard live. “Just My Job”, one of my favorite tracks on the record, explores how we all sell a little piece of our souls just to get by and pay the bills when life’s deck of cards are increasingly stacked against us. Sticking to your guns and not “selling out” gets hard when there is no food on the table and rent is due. “Just My Job”, along with “Pills, Jesus, and War” do a terrific job of exploring these universal themes of virtue versus pragmatism. In fact, many of the songs on the record explore these themes. I can’t help but thinking if Midwest Heart, Southern Blues were a novel it would be written by Elmore Leonard featuring Raylan Givens and Boyd Crowder. Don’t be surprised if some of these songs end up on a gritty TV show like so many other 9B favorites have before them. The songs just have that cinematic quality to them. After American Aquarium did extensive touring opening for Red Dirt and Texas favorites Turnpike Troubadours, I watched American Aquarium “blow up” in Texas. I’m convinced Nick Dittmeier and The Sawdusters have the same ability and opportunity. Midwest Heart, Southern Blues sounds like a Red Dirt, Texas Music album. I certainly don’t mean that to dismiss Louisville or Indiana, I’m very aware of the great music that comes from both areas, it’s just that this is a record that I know could be huge in Oklahoma and Texas given the right support and exposure. The band is on a short tour now with stops in Houston, Tulsa, and Indianapolis. I encourage everyone to check them out live when they come to your town. 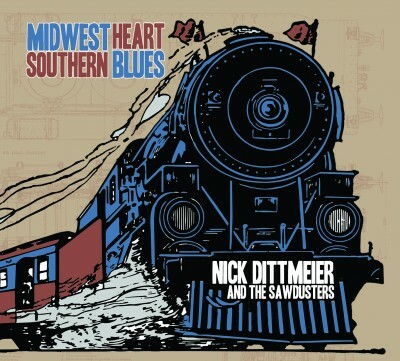 Because, undoubtedly, Midwest Heart, Southern Blues by Nick Dittmeier and The Sawdusters is Essential Listening and sure to be one of my favorites of 2016. Next Next post: Upcoming Mostly Harmless Live Events & Ratio Sessions!